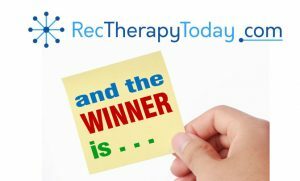 I held a contest for three really call “Rec Therapist” bracelets. 175 people entered for a chance to win one of these. Odds of winning one of these was 3 out of 175 (0.075). People had almost a 1% chance of winning. A random number generator online was used to select three numbers to make the contest fair. Wow! It’s a beautiful bracelet. I can’t wait to wear it! Your bracelet came in the mail today. I love it. Thank you! I’m happy for you to win.